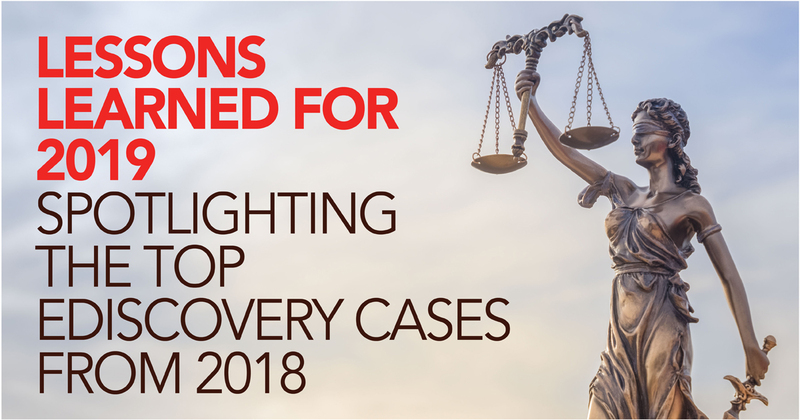 With the New Year upon us, it is worth looking back at some of the key eDiscovery cases from 2018 and examining the lessons they offer going forward in 2019. Case: Small v. Univ. Med. Ctr. of S. Nevada, 13-cv-0298-APG-PAL, 2018 WL 3795238 (D. Nev. Aug. 9, 2018). Summary: The court in Small issued sanctions including an adverse inference instruction against defendant University Medical Center (UMC) for failing to preserve several categories of electronically stored information (ESI). While UMC’s preservation failings were systemic, the court found those breakdowns stemmed in large part from UMC’s failure to conduct effective interviews of its employees. Custodians possessing relevant information were not interviewed until after the court appointed a special master to investigate UMC’s discovery shortcomings—20 months after the litigation began. Once conducted, the interviews were deemed insufficient by both the special master and the court. Lessons for 2019: Enterprises should seek to develop a defensible process for preserving relevant electronic information. Such a process is characterized by various steps including the need to notify key players and other data sources with relevant ESI of the requirement to preserve that information. A critical step to ensuring relevant materials are preserved is to conduct fulsome custodian interviews. Doing so will enable counsel to obtain a better understanding of the nature and extent of unique relevant information in the client’s possession, custody, or control and the steps needed to keep that information. Case: Henson v. Turn, Inc., 15-cv-01497, 2018 WL 5281629 (N.D. Cal. Oct. 22, 2018). Summary: The court in Henson held that plaintiffs’ privacy concerns trumped defendant’s interest in obtaining the complete web browsing history on plaintiffs’ mobile devices. Defendant had sought to image plaintiffs’ mobile devices in an effort to ferret out aspects of their claims that defendant improperly used enhanced internet tracking technology. The court reasoned, however, that if defendant were allowed to image the devices, it would be able to explore sensitive details about plaintiffs’ private lives that were not relevant to the claims or defenses. Privacy considerations militated against such discovery, leading the court to determine that the requested discovery was both irrelevant and disproportionate to the needs of the case. Lessons for 2019: The determination of burden under a proportionality analysis has traditionally focused on the cost of discovery. However, Henson and other cases are increasingly relying on nonmonetary factors such as privacy to evaluate the nature and extent of discovery burdens. This is particularly the case with discovery sought from smartphones and other internet-enabled devices. With smartphones offering a mosaic of a user’s personal life, expect courts in 2019 to increasingly rely on privacy considerations to prevent requesting parties from obtaining overly broad discovery. Case: Salt River Proj. Agri. Impr. and Power Dist. v. Trench France SAS, 17-cv-01468-DGC, 2018 WL 1382529 (D. Ariz. Mar. 19, 2018). Summary: In Salt River, the court refused to order defendant to immediately produce relevant documents stored in France. Plaintiff had sought production of that information despite defendant’s argument that doing so immediately and outside the bounds of the Hague Convention procedures on cross-border discovery would violate the French blocking statute. While defendant’s initial disclosure obligations ostensibly required the immediate production of the information, the court found that requirement allayed by the following: 1) the discoverable information stored in France was mostly cumulative of other information defendant provided with its initial disclosures; 2) defendant would be able to produce the information from France within 60 days; and 3) requiring defendant to immediately produce the information might subject defendant to “severe” penalties under French law. Lessons for 2019: Look for cross-border considerations to increasingly affect domestic U.S. discovery proceedings. Globalization has placed discoverable information beyond the boundaries of the U.S. and, like in Salt River, forced litigants to satisfy international treaties or foreign laws in order to produce or obtain such information. This is particularly the case with data protection laws such as the General Data Protection Regulation (GDPR), which safeguards personal data belonging to people who live in the EU. Clients and counsel must be increasingly cognizant of these and other cross-border considerations even as they litigate discovery issues in the U.S.
Case: In re Domestic Airline Travel Antitrust Litig., No. 15-1404, 2018 WL 4441507 (D.D.C. Sept. 13, 2018). Summary: In Domestic Airline, the court approved plaintiffs’ request for an extension of the fact discovery deadline after determining that defendant United Airlines (United) unwittingly made a document production replete with millions of non-responsive documents. While United anticipated that its production would reflect a “reasonable level of precision,” an apparently “deficient TAR process” yielded only 600,000 relevant documents among a total of 3,000,000 produced (a precision measurement of 16.7%). Given that plaintiffs would have to shoulder the burden of locating the limited number of relevant information amid a production containing so many unforeseen non-responsive documents, the court concluded that additional time was needed to review the information and then take depositions and conduct other discovery. Lessons for 2019: While great strides have been made to simplify ESI search methodologies, the use of TAR and other advanced analytics still requires expertise. Lawyers who are not sophisticated in the use of TAR should engage discovery counsel or consultants who have sufficient experience using these tools and a requisite understanding of the technologies to obtain satisfactory results. Otherwise, parties may not develop a proper TAR process and, as in Domestic Airline, incur increased discovery costs and delays in the resolution of a case. Case: Nutrition Distrib. LLC v. PEP Research, 16-cv-2328-WQH(BLM), 2018 WL 3769162 (S.D. Cal. Dec. 4, 2018). Summary: The court in Nutrition Distribution issued a permissive adverse inference instruction against defendants for their failure to preserve relevant social media posts from Facebook and Twitter. Defendants apparently destroyed the posts after the duty to preserve attached, with one of the defendants defiantly testifying at his deposition that: “I have the right to do whatever I want to do with my Facebook account, regardless of a lawsuit or not. If I wanted to—if I want to delete every single post on my Facebook page, I have the right to do so.” That testimony, taken together with defendants’ failure to produce the requested social media posts, convinced the court that defendants destroyed the relevant evidence to deprive plaintiff of its use in the litigation. Lessons for 2019: Parties must take extra caution to ensure that relevant social media posts are preserved for litigation. Like data from messaging applications and other smartphone apps, social media content is dynamic and can be easily modified or destroyed. Litigants in 2019 should have an updated litigation readiness program with questionnaires that spotlight different social media platforms and smartphone apps (particularly those used for messaging) that may contain relevant information. Promptly issuing a litigation hold instruction, together with a relevant source checklist and appropriate follow up measures, can help avoid a sanctions disaster like the kind that befell defendants in Nutrition Distribution. Philip Favro acts as a trusted advisor to organizations and law firms on issues surrounding discovery and information governance. Phil provides guidance on data preservation practices, litigation holds, data collection strategies, and ESI search methodologies. In addition, he offers direction to organizations on records retention policies and the need to manage dynamic sources of information found on smartphones, cloud applications, and social networks. Phil is available to serve as a special master on issues related to electronic discovery. Phil is a nationally recognized thought leader and legal scholar on issues relating to the discovery process. His articles have been published in leading industry publications and academic journals and he is frequently in demand as a speaker for eDiscovery education programs. Phil is a member of the Utah and California bars. He actively contributes to Working Group 1 of The Sedona Conference where he leads drafting teams and serves as the Steering Committee project manager. Prior to joining Driven, Phil practiced law in Northern California where he advised a variety of clients regarding business disputes and complex discovery issues. He also served as a Judge Pro Tempore for the Santa Clara County Superior Court based in Santa Clara, California.